Alan Reynolds is confident that his side can turn their recent run of form around. Photo: Inpho. 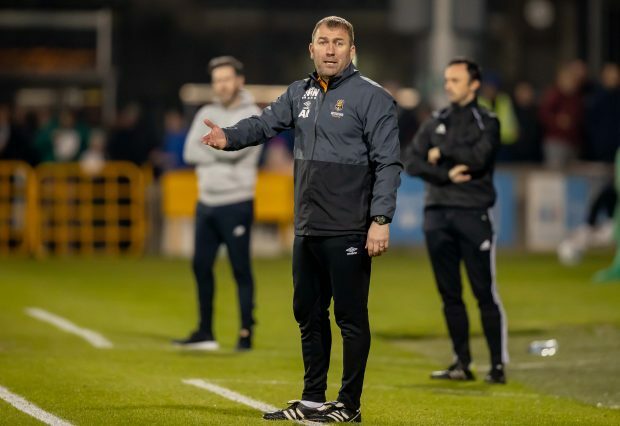 With Waterford FC only managing to pick up ten points from their opening eight games in the SSE Airtricity Premier Division, manager Alan Reynolds is asking for people not to panic after his side slipped to just three points outside the relegation zone after a 2-1 defeat against league leaders Shamrock Rovers on Friday night. After suffering a humiliating 4-1 defeat the previous week against UCD, Reynolds’ side were hoping to bounce back with a result, but they came up a Rovers side that are flying high at the summit of the table after a commanding performance against a Waterford side that battled to the end. Speaking after the game, the Waterford boss said, “We came with a game plan tonight and that was to stay in the game for the last ten or fifteen minutes. I think that if we played wide open against players of that calibre, we would have been in big trouble. “I thought that it was a sloppy goal from another set piece. We have our markers to pick up from corners and we just didn’t do it. It was a goal that killed the game as a contest. I suppose it’s a pity we didn’t score our goal with five or ten minutes to go in the game. “As I said though we came with a plan to more or less spoil the game. It wasn’t great to watch for anyone I would have thought, but look they are a good side, it’s the way we needed to play and we’ll dust ourselves down ahead of our next game. “I suppose we’re disappointed there, but I think that there is enough of character in our squad. Players are hurting at the minute, but they want to do well so I’ll work with that all day. I suppose you could say that they scored a soft first goal as well. “Maxi took one off the line and Matt made a great save so it could have been more. There will be teams come here this season and will get well beaten. I think that anyone that finishes above Shamrock Rovers this season will win the league. “They are well ahead of everyone and they are comfortable at the minute. They are a very good side so you just have to give them credit for that. I think that we need to look after ourselves now again and hopefully we can bounce back over the coming games.